Are you a college student interested in a law career? Maybe you love watching reruns of “Law and Order” or “The Practice,” or maybe you want a professional degree to stand out in today’s competitive job market. As a college student, there are things you can do now to set the stage for a future career as an attorney. Read these tips on preparing for a law degree, and check out the list of skills you need to succeed in a law career. Study hard and compile a record of academic excellence while in college. However, don’t worry if you are not at the top of your class. There are law schools for students of nearly all academic backgrounds since there is a wide range of competitiveness for admission to different schools. Law schools look at more than just your grades as well – they care about your LSAT scores, your skill sets, your extracurricular and work history, and your reasons for applying to law school. Take a couple of law courses if they are offered at your school to experiment with the type of study required and to test your interest. An academically challenging major will help you to develop a strong work ethic. A challenging major will also help you practice important skills that will be necessary for a law career, like critical thinking, argumentation, and writing. If you already know what kind of law you are interested in, you can use that to help decide your major. Political science or history are great majors for those interested in government or politics. Economics and business are ideal for those interested in corporate law, psychology for criminal law, biology for health law and computer science or engineering for technology or patent law. English is also a great major for a future legal career because it helps you develop your writing and argumentation skills. Investigate opportunities through your school to participate in moot court and other debate activities. 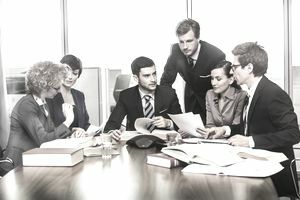 Law schools will see this engagement as evidence of your genuine interest in the law; this can help separate you from the many applicants who choose law as a default career option. Consider participating in student government since you will gain experience in drafting legislation for your campus. This is another terrific experience to mention in your law school applications. Most law schools are interested in attorneys who will spend some of their time advancing the public good. Some volunteer positions might even involve writing memos, campaigning, or other skills that will be valuable in a future legal career. Law is a writing-intensive profession. Strengthen your writing skills and demonstrate these skills by doing a senior project or independent study, working for your campus newspaper, taking a couple of English courses, creating a blog, or choosing a writing-intensive major. Line up interviews with as many attorneys as possible through alumni and family connections. Try to speak with attorneys in different fields of law to get a rich sense of the many areas of legal practice. This is a good way for you to learn what fields of law you are most interested in. Job shadow a few attorneys in interesting fields to see what it is like to be in their shoes for a few days. It can be fun to go to court and observe proceedings! Talk to someone in your college career services office or your alumni office, or speak with a family friend in law to arrange a job shadow experience. Gain some legal experience by interning at a local law firm or legal aid society, or interning with a public defender or district attorney. Working side by side with attorneys can help you verify your interest in the field and make valuable contacts. If you have a good experience at a law firm as a college student, the internship might become a summer job while at law school. If you have already graduated or aren't ready to attend law school right after graduation, consider working as a legal assistant (also known as a paralegal) for a couple of years prior to law school. The pay isn't bad and you will be able to meet many different lawyers and observe their work (even though you may be performing very basic tasks). Try to work at a law firm you are interested in or a firm that practices a type of law you are curious about. This will also help you decide what kind of law career you might want to have. If you follow these steps in the years prior to law school, you will be more likely to make a sound decision about your legal career and amass an impressive array of credentials for your law school applications. From environmental law to criminal law to property law, every legal career requires a different skill set. However, there are a few skills that are necessary for anyone in law. While in college, look for opportunities to develop some of these skills. You can work on these skills in your classes, extracurriculars, and volunteer activities. For example, you can develop your research skills while working on a thesis paper, or practice your leadership and teamwork skills by participating in student government. When you apply for law school, use some of the skills keywords below in your applications. In your application, highlight the experiences that helped you develop these skills. This will help you stand out from the competition. Interpersonal skills: Lawyers have to interact well with a number of people, including clients, clerks, and judges. They have to be able to maintain positive relationships with their clients and listen carefully to their clients’ needs. They also need to be able to resolve conflicts and mediate disputes. All of this requires the ability to work well with and get along with others. Lawyers also have to be able to work with a team. Many law firms have lawyers work in pairs or in teams for large, complex cases. They need to be able to share tasks with others to complete a job.